List of NTC Services - How to Activate NTC Services? 1 How to Activate NTC Services? NTC has provided lots of features these days. You can know your number, check balance, activate data, buy data package, activate ringtone, activate call waiting on a single click. 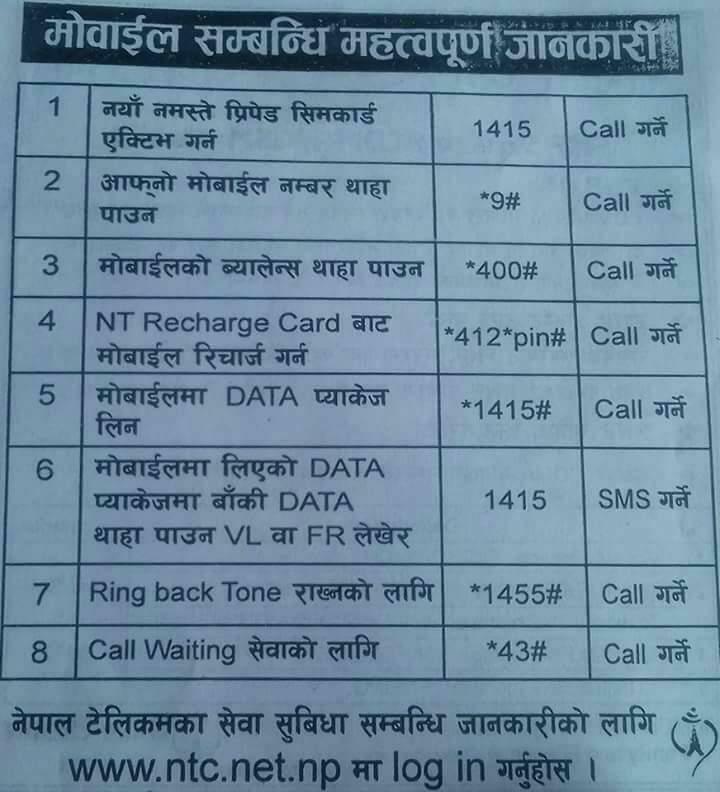 We have listed out syntax for checking all NTC services including NTC data pack, NTC call waiting, NTC ringtone. How to Activate NTC Services? The image shown above clearly describe the process to use NTC service on your mobile phone. Activate NTC Sim card: You need to call 1413 to activate your SIM. Know your NTC mobile number: You need to call *9# to know your own number. Know NTC balance: You need to call *400# to know your balance. Recharge NTC mobile from NTC recharge card: You need to call *411*pin# to recharge your mobile using recharge card. Activate NTC data pack: You need to dial *1415# to activate NTC data pack. Know remaining data in NTC: You need to message writing VL or FL to 1455 to know your remaining data in NTC. Activate NTC Ring back tone: You need to dial *1455# to activate NTC ring back tone. Activate call waiting in NTC: You need to dial *43# to activate NTC call waiting.